Many people learn SketchUp from free videos or other online resources. If you have the time to sort through all of that, and manage to pick up the right things, you might be one of them. A lot of people have learned how to use SketchUp from my digital book “Woodworker’s Guide to SketchUp”. When I wrote the book, I focused on the specific things I struggled with as well as the common things I saw people I taught get stuck on. SketchUp is one of those things that almost anyone can pick up and get results. But to get really good at it, you need to practice, and most important, you need to practice the skills that will lead you to an efficient and predictable workflow. What you can’t get from videos or a book is someone looking over your shoulder and saying “click this, not that”, “here is the solution to your problem”, or “try this instead”. Here is a review from someone who took a three-day SketchUp class. This post is about a recent class. Classes at the WIA conferences will be an hour and a half overview of SketchUp and a Question & Answer session. Sign up for my newsletter, or subscribe to our RSS feed for future class announcements. 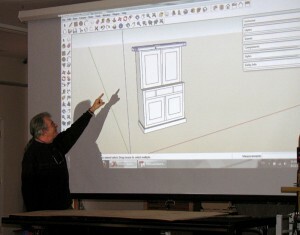 If your woodworking club, or other organization is interested in hosting a SketchUp class, click here to contact me.